May 15, 2015 at 10:09 am Add a comment! Well, it’s been a strange year. The spring was late to start and early to finish. 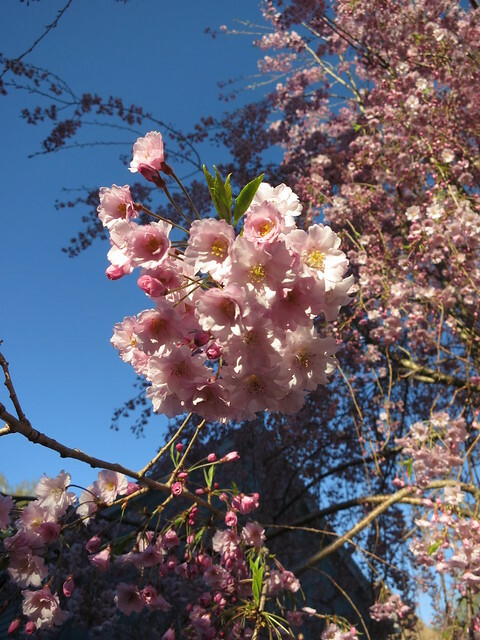 My cherry tree bloomed a full 2 weeks late from April 15 last year to May 2 this year. There weren’t many of those April showers we’re supposed to get but it was cold so we didn’t notice. Then temperatures heated up and still no rain. The ginger is looking great and that astilbe is coming back despite being utterly convinced I had killed it! I love the ferns little curly heads! 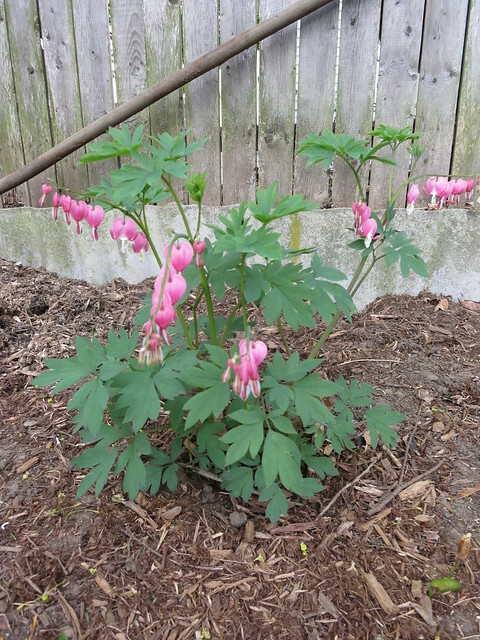 Bleeding Heart is in full bloom! 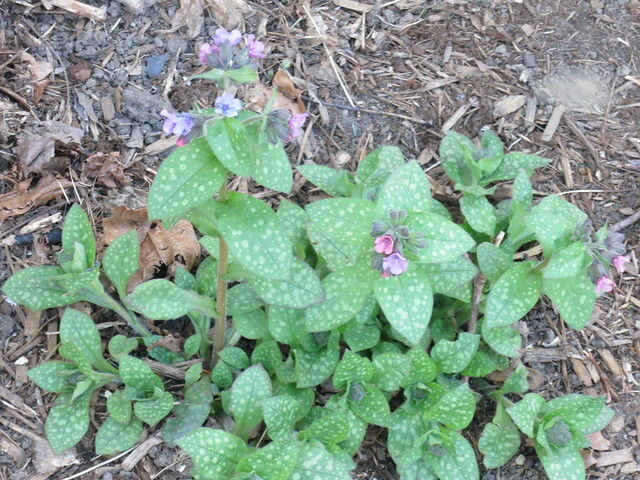 The Lungwort is blooming beautifully! Here it is on May 2. 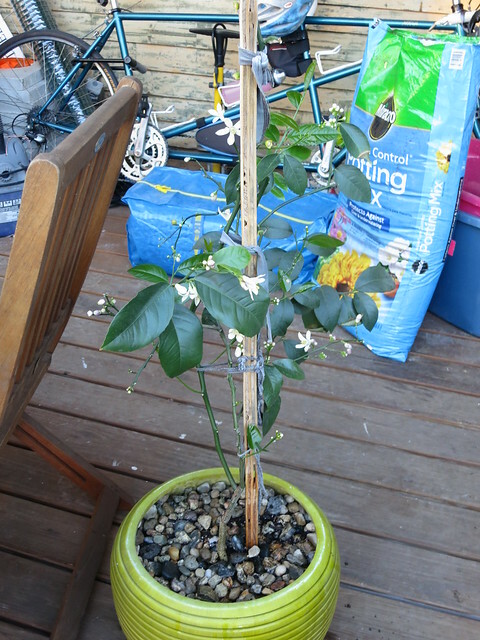 The Meyer Lemon has been moved outside as has the tandem bike and the back deck is ready for planting! 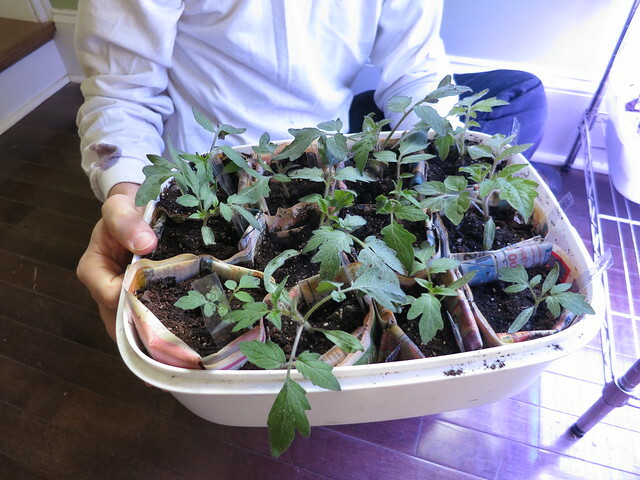 The tomato seedlings are huge! And the Zinnias I planted May 2 are doing great! 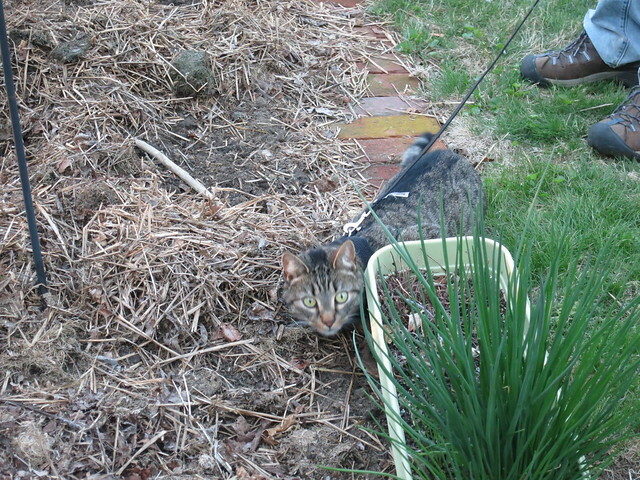 Vector is exploring the garden using his powers of camouflage. The chives are doing great. I’m thinking about planting them in my flower beds but I’m worried they will take over. They are such a great bright green and they are green all season long! The peas have sprouted and the pea trellis is still standing. 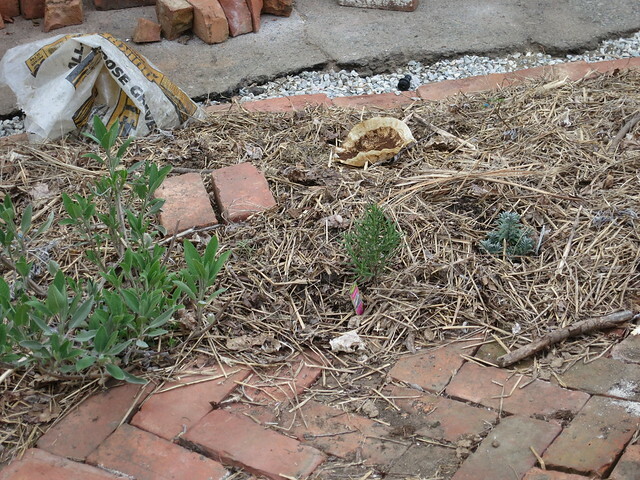 I’ve planted a rosemary and lavender plant next to my old sage that I started from seed! I’ve never been able to keep them alive over winter in pots but I’m hoping in the ground they will do alright. I planted them close but I plan on keeping them pruned pretty small. 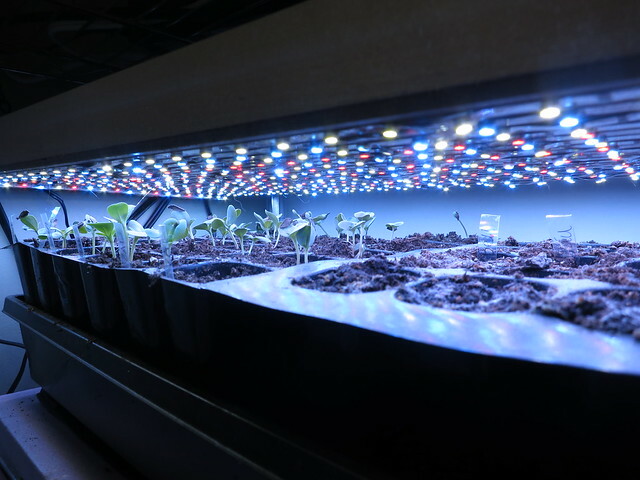 Arugula and Spinach have sprouted. 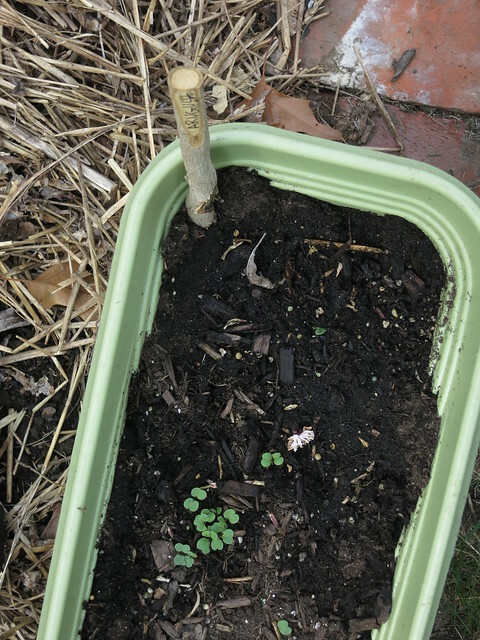 I’m trying to grow them in a container to try to protect them from the bunnies. 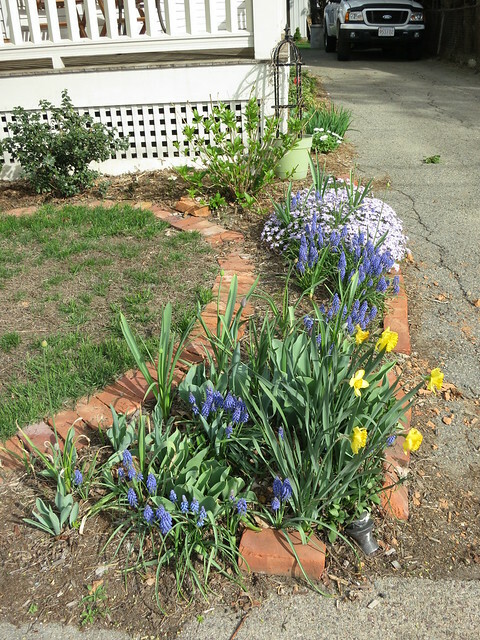 The muscari are up and the daffodills are just about done. The Creeping Thyme is blooming wonderfully. The tulips are just opening but I think they are going to go fast this year. The Alliums are nearly blooming and I have tons of little baby alliums that have poked up. Stefan very deliberately spread the seeds last year. We’ll see if any make it to blooming size. I really need to figure out what’s going on with the bricks here. I either need to dig them in or pull them out and I’m not sure what I should do. My Iris’s are planted too deep and need to be lifted which I WILL do this fall. I was tempted to do it a couple weeks ago but with this drought and heat I’m glad I didn’t. 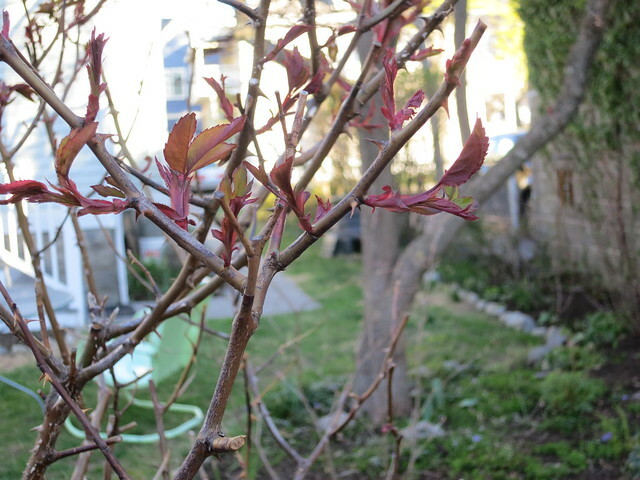 I don’t expect any blooms this year but the leaves are looking good. I also have a lone red tulip which has bloomed for the first time. This tulip came with the house and has sent up a flower every year and every year a squirrel snaps it off. It seems to have escaped beheading this year. This picture is from May 9. 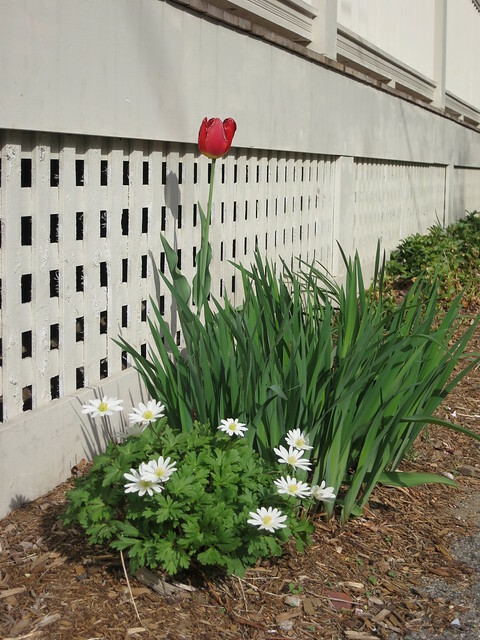 By May 13 the tulip had faded…quick year for tulips. 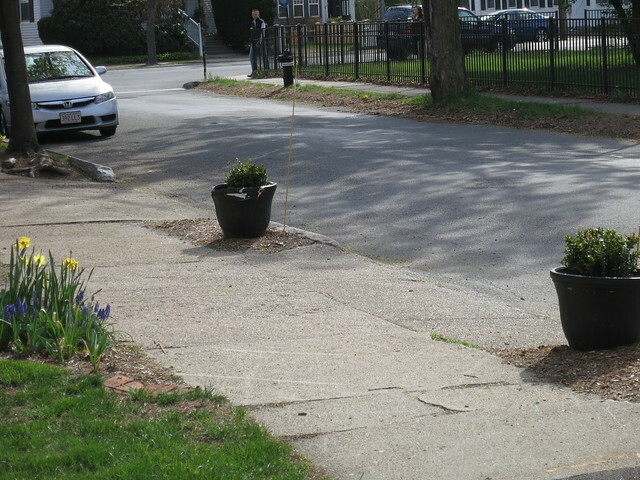 The driveway boxwoods have survived but they need new pots. The ones I used did not survive the repeated hits with the car. I did a potted spikey thing in a purple pot by the stairs again this year. 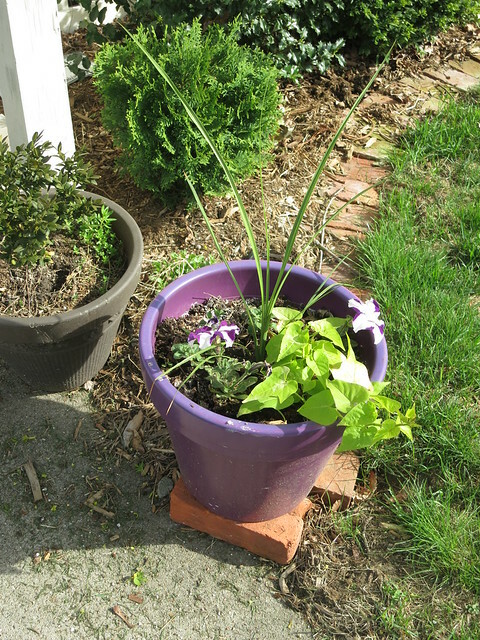 It’s got a spikey, sweet potato vine, and petunias. I did this last year and heavily fertilized which made it look great! I’ve been waiting on the rain to fertilize but I can’t hold out much longer. To the left of the porch steps is another bed where I’ve completely removed the grass and attempted to get Vinca, columbines,and foxglove to flourish. 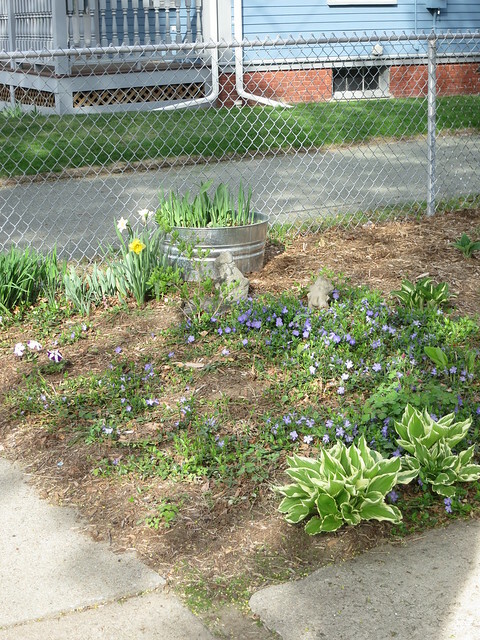 The vinca is slowly filling in and the iris along the fence are again too deep and probably won’t bloom. Oh, and waiting for the new fence from cansupplywholesale.ca/. The hosta may get moved into the back yard this year though I’m hoping maybe I can just split them. The galvanized tub of iris and bulbs will get transplanted this year and I’m hoping to get a Snowball Viburnum to plant just beyond that. 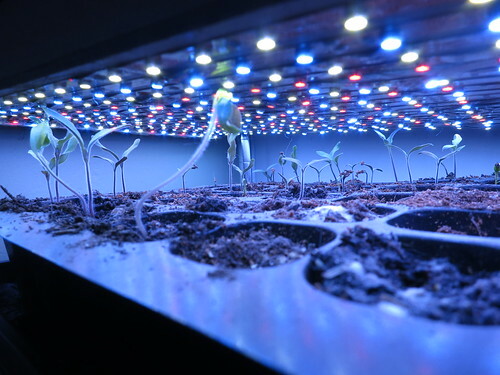 In the end, we rocommend to check Suppleplant for more information on how to take care of your beloved plants. The spring flowers are coming and going so quick with this hot dry weather. I just hope we get enough rain for the June roses! I’m going to try to keep better records of what I’m doing in my garden this year. I figure doing a monthly garden chores post will do the job! For reference I am zone 6a with a last frost date of May 17. We still had snow on the ground for most of March so my March chores got pushed to April but some of these are March chores depending on the weather. I plan for tomatoes to go in the ground for memorial day weekend. Count back 8 weeks and start my tomatoes, peppers, cauliflower, and in Late March. 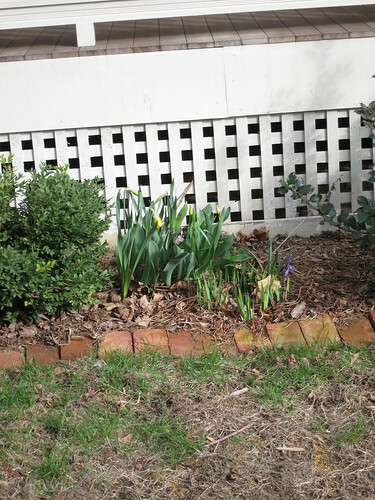 This year I planted a flat April 7, after we got back from London. Massachusetts has a very special state Holiday. Patriots’ DayP celebrates the battle of Lexington and Concord, the first battles of the American Revolution on April 19, 1775. It is now celebrated on the 3rd Monday of April. It is also the day of the Boston Marathon. Stefan and I have the day off work so we get a great early-spring 3-day weekend. The Roses should be pruned. We had a lot of snow weight damage this year so lots of pruning. I also fertilize the Roses at this time. 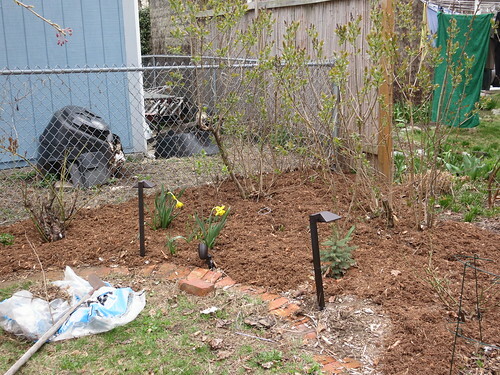 Ideally you should get to the roses before they start sprouting but I was a couple days late this year. I cut the showy roses (I don’t know any of the varieties) back by about 1/3 and get rid of any branches that are damaged, touch each other, or are growing into the bush instead of out. For the 2 Knock-Out roses, I prune back the branches that are growing into the bush and shape the plant into a nice round-ish shape. 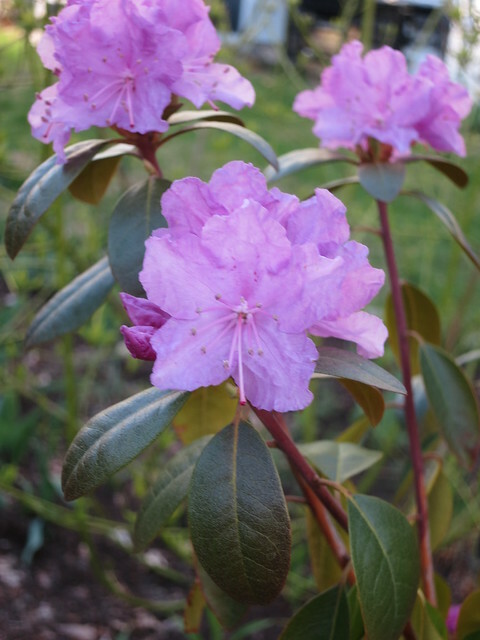 I don’t prune nearly as heavily since I like them to get nice and big and they flower so profusely no matter what you do. I also fertilize under the drip-line of the plant. I cut all the dead leaves off the iris plants to clean them up. My irises all need to be lifted. This fall I HAVE to do that! The Butterfly Bush was getting out of control. I went ahead and whacked it way back, almost to ground level. It looks pretty bad but never fear, it will come back. I use these early spring days to fertilize the evergreens including the Arborvitae, Boxwoods, and Holly. 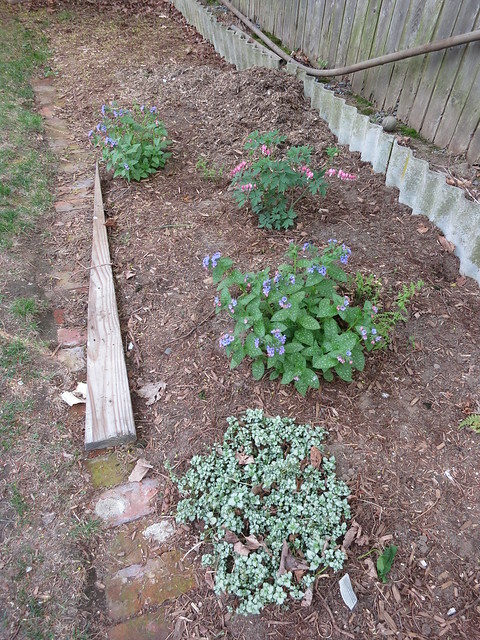 I also spread a pre-emergent herbicide over the beds. I have a serious morning glory problem that I’d like to keep at-bay. I love Morning Glories on the fence but they start to climb the roses and pull them over. This is my first year with the pre-emergent. I’m curious how it will do. 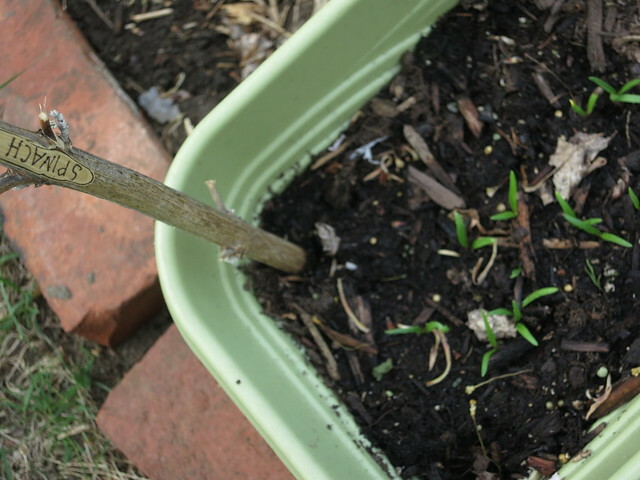 I also went over the beds and pulled any little weed sprouts. I’m really going to try to do that on a schedule every week. 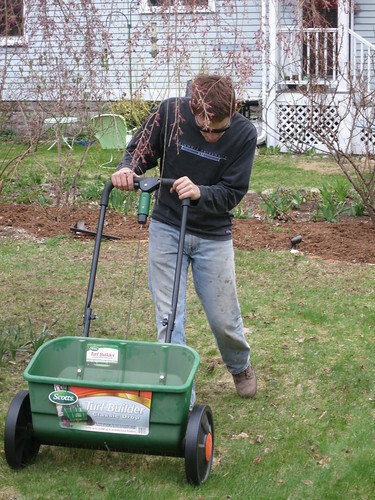 In late April, when the soil is in the 50s, it’s time to spread Crab Grass Preventer on the lawn. Crab Grass germinates when soil is between 54 and 57 degress so once the soil is up to 60 F, you’re late. We prefer a drop spreader to a spray spreader. It makes it easy to spread just when and where we want. Stefan had to duck to get under the almost-blooming cherry tree. We purchased 16 bags of ceder mulch and spread them in all the beds this weekend. 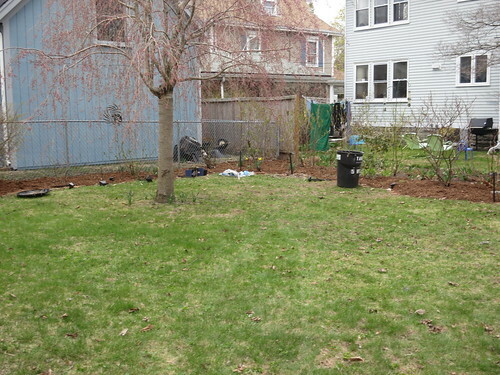 Late April is a good time for mulching, the soil has thawed and started to warm up. We buy our mulch by the bag because though we have a truck, it ends up being just about the same price if not cheaper to buy mulch by the bag and so much more convenient. Around here, many of the mulch places only have a 2 yard scoop which is more than our little truck can handle so we’d need to have it delivered and there just isn’t a good place to put it. I do love a freshly mulched bed. 16 bags did the back and left side of the yard. I suspect we’re going to need about another 16 bags to do the right side of the lawn and the front. The yard had dried out enough to give it a good raking this weekend. All the debris of the snow cover is all cleaned up. I was tempted to do it a weekend earlier but I was worried that it was still too wet. 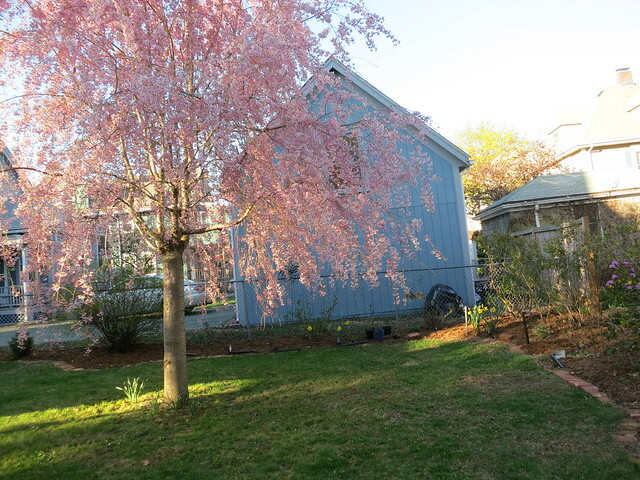 The lawn is greening up and that cherry tree is so close to blooming. I topped off my veggie garden with leaves last fall. 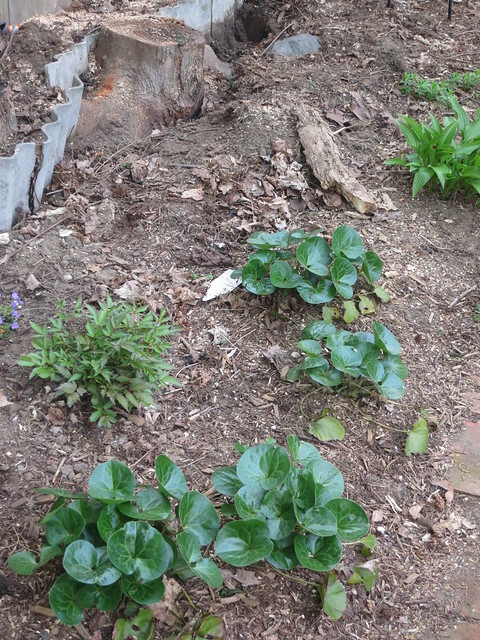 I’ve been tossing coffee grounds on the garden since it lost its snow-cover. To prepare it further, I raked off the bulk of the leave leaves and added 3 bags of composted Cow Manure to the Veggie Patch. 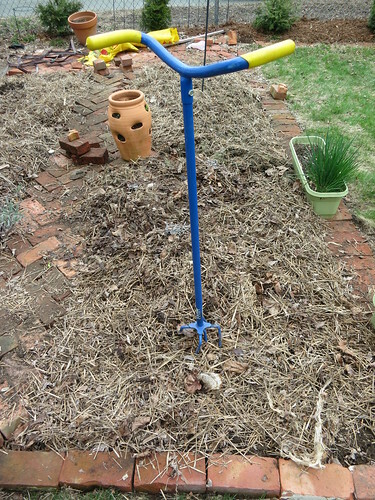 I tilled the manure and a good bit of leaves into the patch using my handy Claw that I bought for $1 at a yard sale and LOVE. The leaves are well on their way to being decomposed and they are supposedly good at aerating the soil. I just rake the remaing leaves back onto the bed as mulch. I generally stick to the leaves from the cherry tree for the garden. They are nice and small. The maple leaves just mat and don’t decompose quick enough. Stefan did shread some of the leaves with the lawn mower last fall and those are also on the veggie garden patch. Unfortunately, I ran into a bit of a snafu while I was preparing the garden. I discovered the reason my cherry tomatoes didn’t do so well last year. 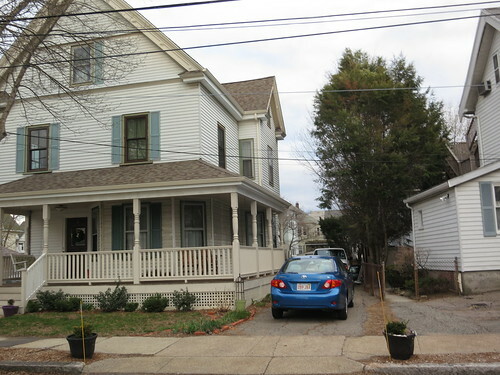 There is an asphalt sidewalk all the way around the house. Turns out there is a concrete sidewalk underneath it about 6 inches down. As I was digging this year, I found the concrete sidewalk sticking into the garden about a foot. I must have planted that tomato in the 6-8 inches of dirt and it’s poor roots ran into that concrete. It looks like the concrete had been patched with black-top patch several times so a sledge hammer and crow bar did an adequate job breaking it into pieces which I dug out. This delayed the early spring peas, Lettuce and Onions I had planned on putting in in late April. I planted Peas on 4/26/15 along with Lettuce and onions. I had started some cauliflower from seed but I haven’t had any luck with germination. I went ahead and built a little pea trellis with some twine and pipe-hanger tape. I just used a piece of scrap wood to make the center post and stapled the twine to it. 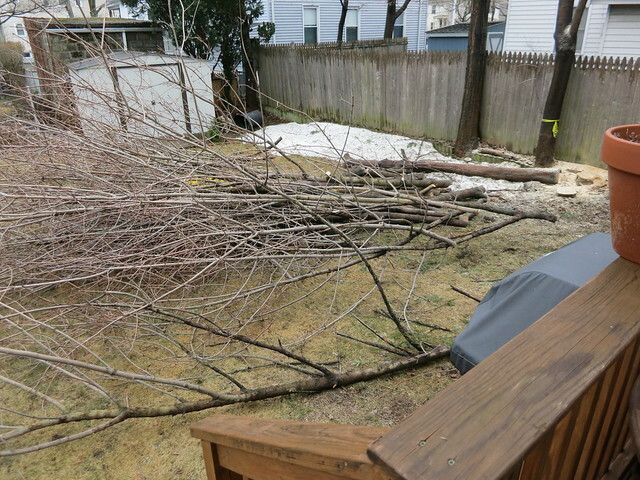 While we had a nice day, we went ahead and dug out this area of the side-yard. 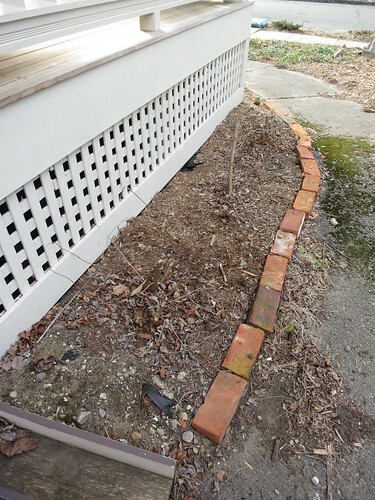 I had a brick pile here for a while and moved it last year. I’ve had the rocks ready to dig this area up, put down landscape fabric, and fill it with rocks since last spring and this April was a perfect time to finish off this little project. I’d like to also get a couple stepping stones to make it a little easier to walk on. 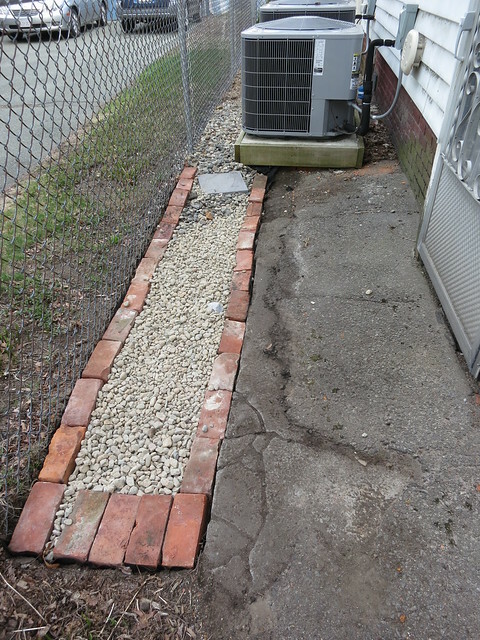 I bricked the end of the rock patch to keep it nice and contained. Here is is before. 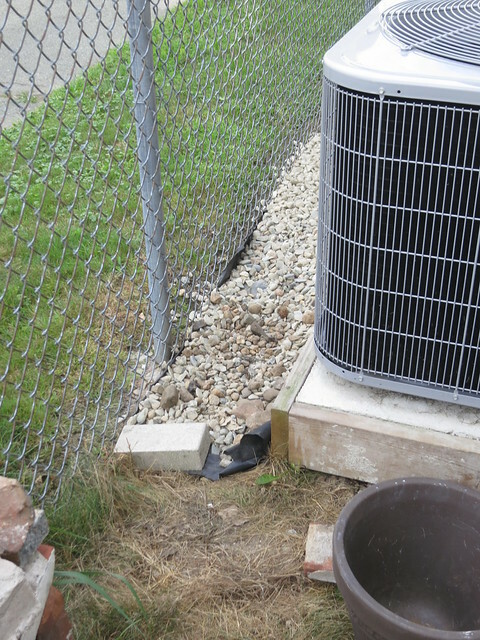 I had already done a bit of rock-work between the AC unit and the fence. Found some lovely ideas here! I just began with the seed starting and as I plan to repot my seedlings before officially planting them outside, I think they’ll be strong and big enough on time. Very happy to read your ideas, all the info is quite useful. My sister will be very glad to read your post, so I’m surely recommending to her too. Thank you for sharing and happy gardening! April 26, 2015 at 11:08 am Add a comment! 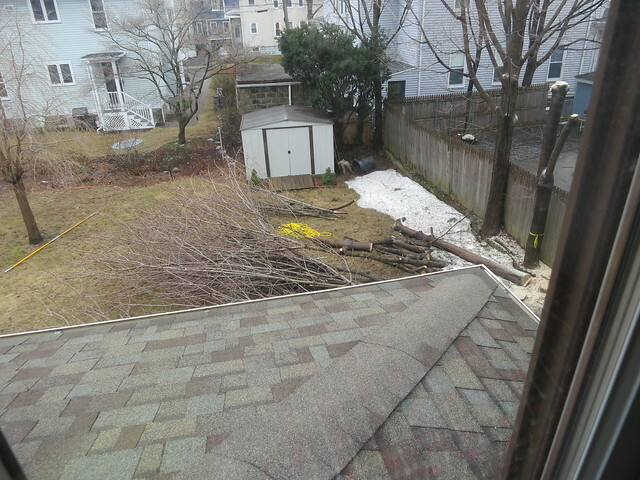 We had some trees on the property line taken out. We had hoped to have it done this winter but the snow-cover prevented it. The tree people were also very busy dealing with ice-dams. 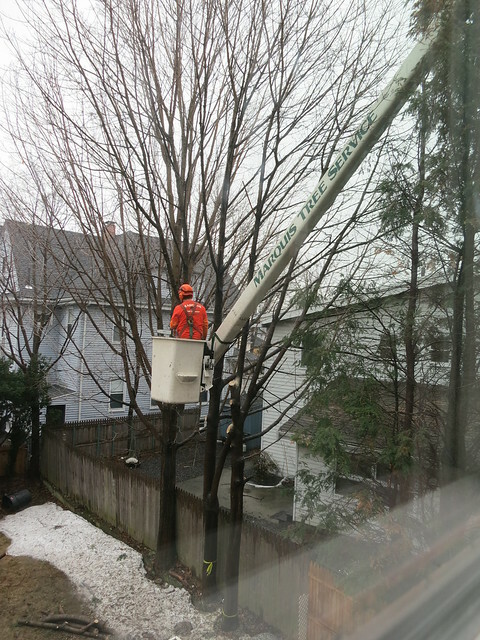 Big Cherry Pickers are the only way to safely remove ice dams so if you ever have a freak winter, start calling tree removal companies. pro-tip. It’s amazing how creepy overgrown brush looks. 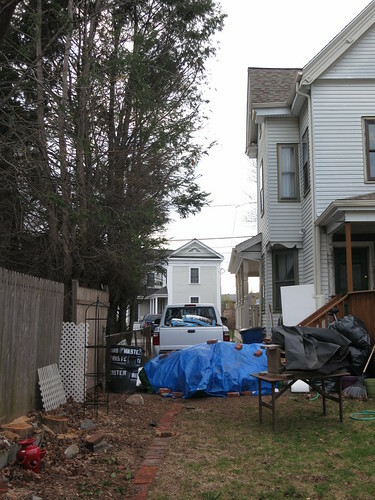 I suppose it also looks creepy to have a big pile of trash in the driveway but my guy Valentine is coming soon to haul it away! Here is the before picture. We are removing the right 2 trees. They are Norway Maples which are an invasive species and a very weedy tree. 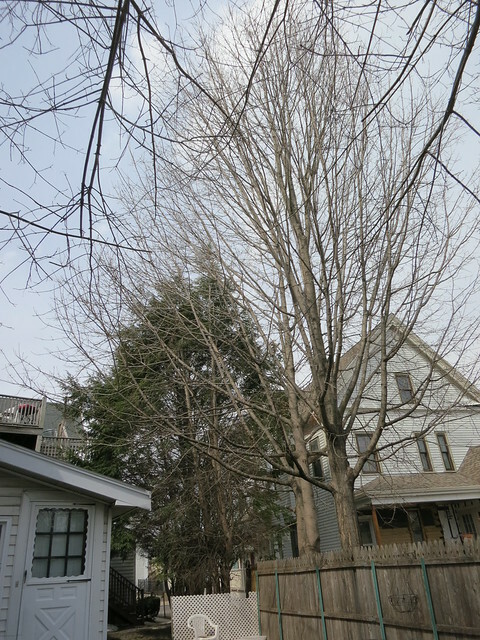 The one on the left has bark like a sugar maple and leaves like a Norway. 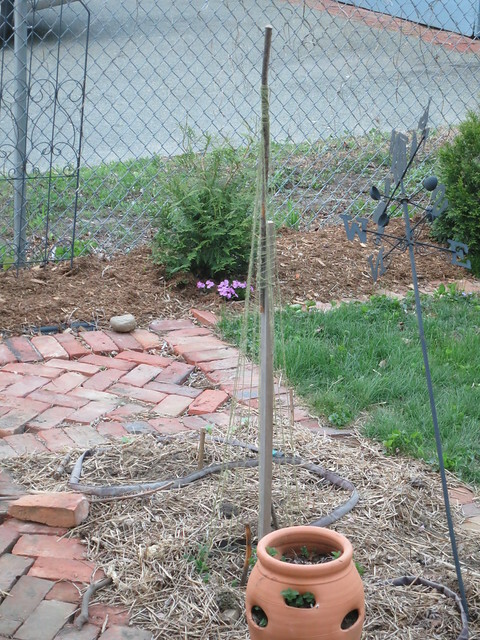 The Tree guy was unsure but it is an older tree with a very strait trunk and seems to be healthy so we elected to leave it. You can see the 2 on the right are younger and have some waves in the main trunk. Norway Maples grow too fast, leaf out too early, and retain their leaves too late. According to the staff from Perth Roofing & Ceiling Specialists Insulmate, this is a hazard for roof tops, an early or late snow storm brings them down all over town. Add a shallow root system and you really have a recipe for disaster especially when they are spaced as tight as these 3. 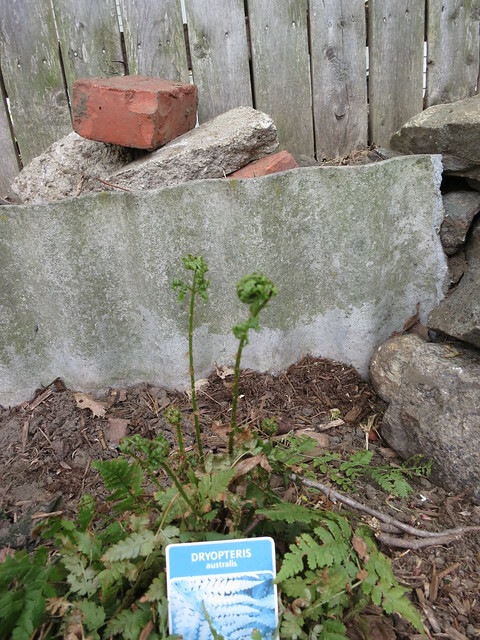 It is now illegal to plant or cultivate Norway Maples in Massachusetts as they are deemed a damaging invasive species. They make terrible city trees and can cause a lot of damage. It is always sad to see trees of any variety torn down but it was time for these guys. Here they are from the neighbor’s side of the fence. 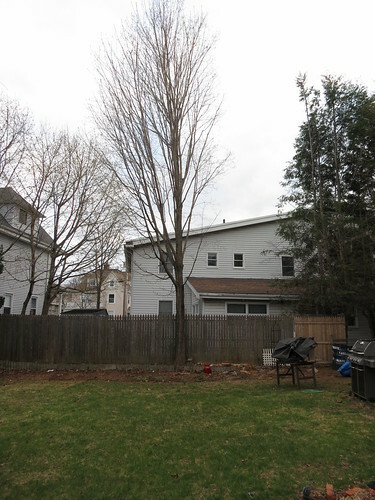 The owners of this property are out of state and you can tell that these trees are certainly causing damage to this property. They have branches resting on the roof. You can hear the squirell infestation from our yard not to mention the roof damage! I think the owners were pleased we were taking the initiative to get these torn down. They split the cost of removal but it’s nice to have someone else schedule and plan the whole thing. The crew would also have needed to use our driveway regardless. The first thing the crew did was strip all the branches from the main trunk. We watched from the second story window, from my office nook. 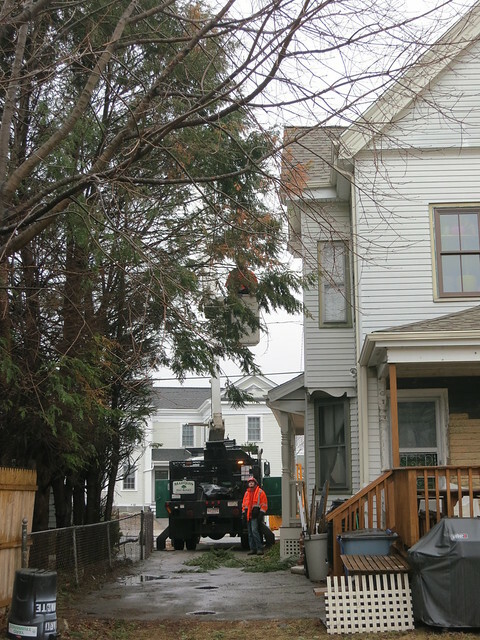 They used a little bob-cat to drag all the branches down the driveway to the chipper on the street. We had to get to work so we didn’t get to watch them. I’m not sure it necessarily looks better. 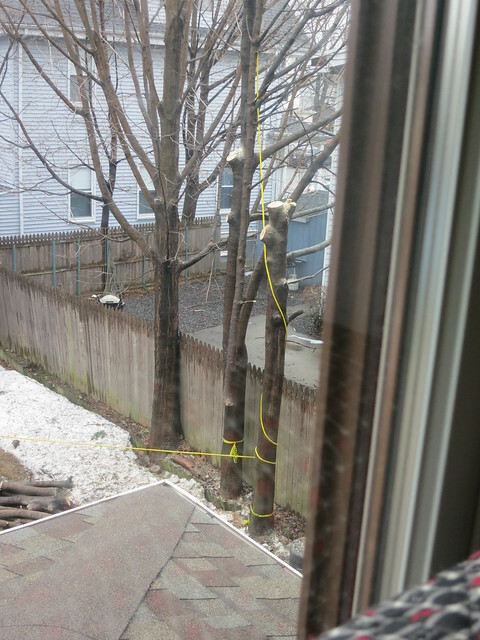 We do have a much less restricted view of the neighbors but it was a necessary step. 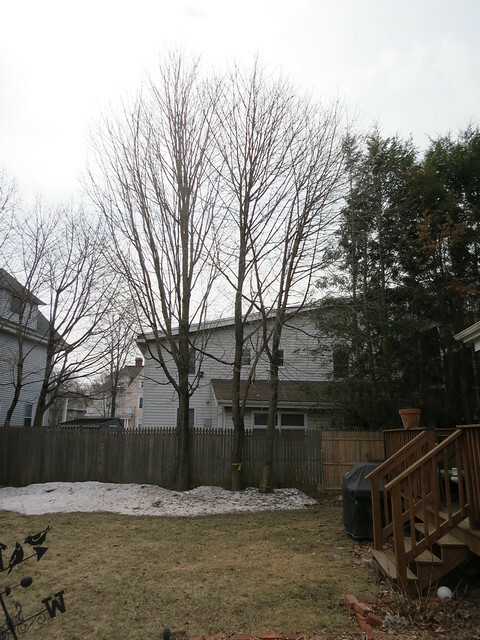 The sugar maple will fill out to the right and we can add a smaller tree decidedly on our property to help give a little more privacy. I’m hoping we won’t even notice they are gone once the trees have leafed out. Soon! April 23, 2015 at 1:00 pm Add a comment! It’s been a long winter but we are back to our old tricks. 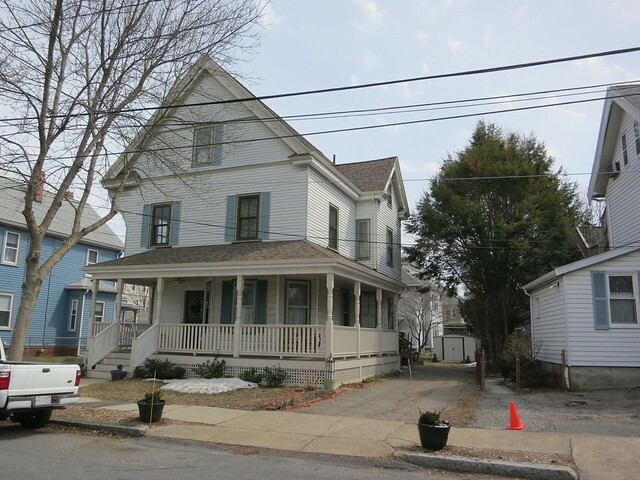 Here is one little project we worked on while it was still very much winter in early March. We have finally added Toe-Kicks to the Kitchen Cabinets. It’s a little change that makes the room feel so much more finished. 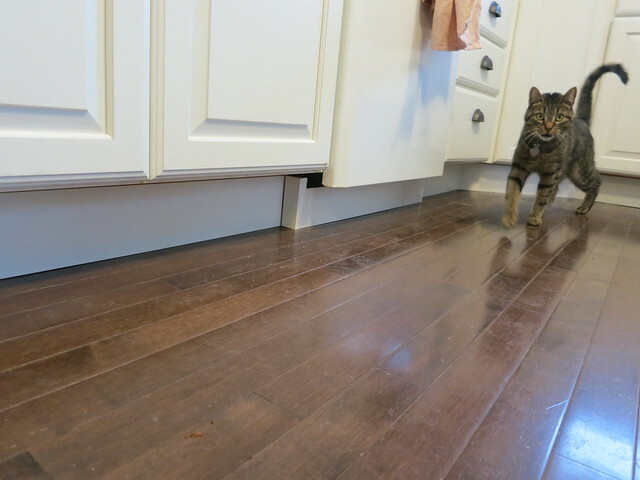 For the uninitiated, toe-kicks are the piece of trim that go underneath the cabinets. In this picture from our 1 year anniversary in 2012, you can see how each cabinet has a gap in the toe-space underneath the cabinet. The toe-kick covers those gaps and is painted white to match the cabinets. It also covers any shims you used to level the cabinets. 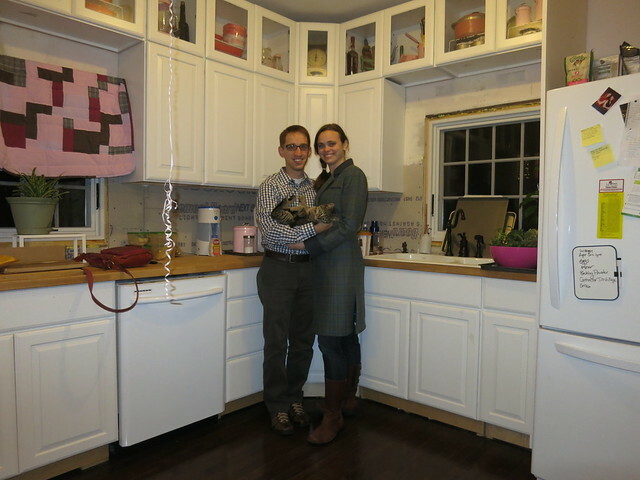 Wow, the cabinets have been in since December 2012! These toe-kicks were way overdue. 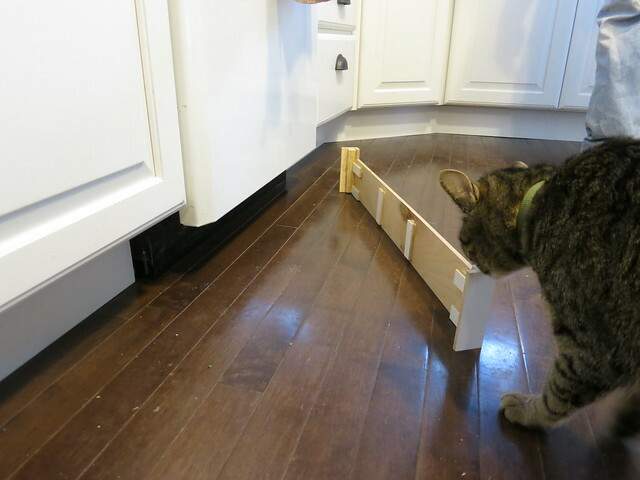 We also built a little cover for under the dishwasher. The toe-kick piece of the dishwasher is black so it needed to be hidden. It looks so much better with this little additional touch. Here is a detail of the dishwasher cover. We just tacked it onto the dishwasher with hot glue. It will pop off if you tug on it but was just enough hold to keep the cover from falling over. I should be back to blogging more regularly since the snow is gone and summer is upon us. We have pulled out the Tandem bike but it still isn’t quite warm enough to ride. We’ve made progress on a couple more projects I will be sharing soon. 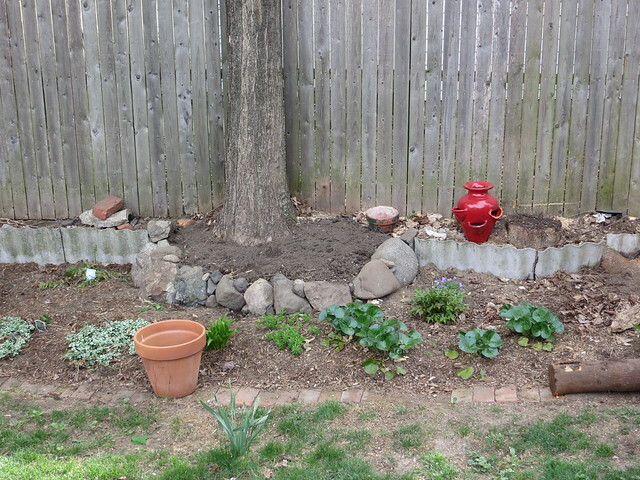 And, it is just about time for an early spring garden post. 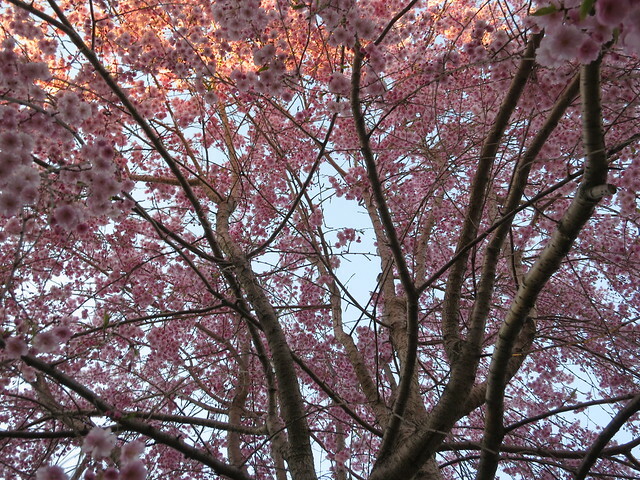 I’m hoping the cherry trees bloom this weekend!